The purpose of the project was to provide attendees with show information, including: exhibitor location; exhibitor, sponsor, and conference information; and the nominees for "Best Practices". 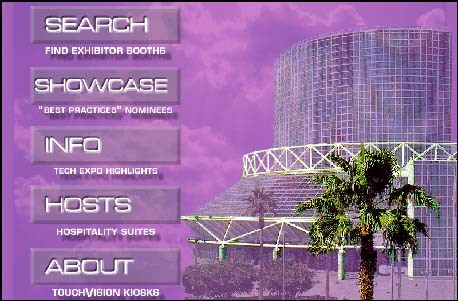 These two kiosks were placed in the Los Angeles Convention Center lobby and utilized by the show attendees to find exhibitor locations and show information. FutureTouch developed a database application to allow an attendee to search by vendor name, or by keyword, such as the product or services desired. A functional floor map was created which "lead the way" from the exhibit hall entrance to the vendor booth. Two FutureTouch projects placed highly in the Best Practice Awards Showcase at this show.